If oil is in short supply, what should we do? One idea is to add nuclear, but this doesn’t work as well as one would like. The big issue I see is that nuclear power plants have a very long life. They are now being planned for a lifetime of 60 years. When one adds time for building and decommissioning, plants under consideration today may be finally wrapping up operations in 2080. The problem is that with peak oil, we really don’t know what the world will be like in 2080. There is a possibility that even with less oil, everything will work together fine in the next 70 years. If this happens, the securities set aside for decommissioning will have their intended value, and international trade will still be operating at close to today’s level, making repairs during the 60-year lifetime and decommissioning relatively easy. But there is also a possibility that things won’t be working together so well by then. It seems to me that we need to be thinking through this possibility and making plans accordingly. The issue we are dealing with is the fact that conventional oil supply has already begun to decline, and will almost certainly be declining more in the next 70 years. (Even the International Energy Agency’s World Energy Outlook 2010 agrees that we are past peak in conventional oil supply.) There may be a rise in unconventional oil, and in biofuels, but it is not clear that they will make up the shortfall. Figure 1. 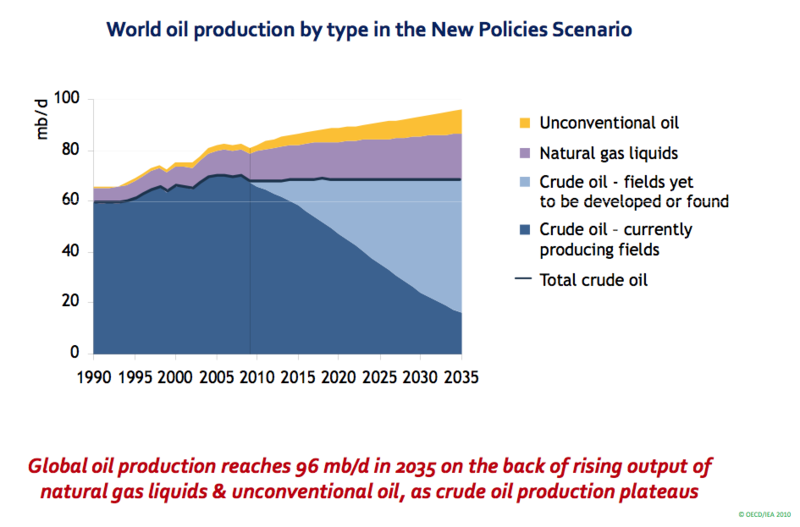 IEA's estimate of future oil world supply from its middle of three scenarios included in World Energy Outlook 2010. The amount of oil to be produced from the light-blue area is very much disputed. I think that when planning for the future, we need to consider at least the possibility that the IEA’s estimate for this sector is too high. If one reduces the size of the light blue sector, one gets a forecast more like Colin Campbell’s, which I show below. This graph is from the April 2009 newsletter of the Association for the Study of Peak Oil – Ireland. Figure 2. 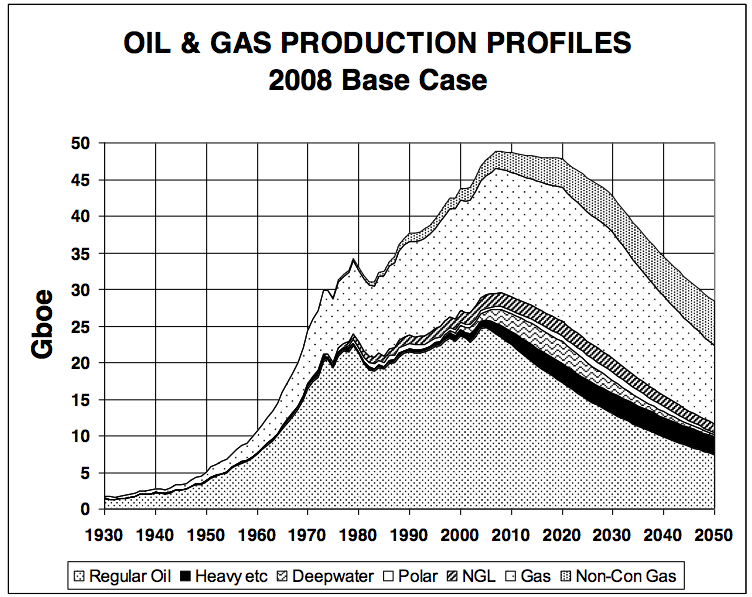 Forecast by Colin Campbell of future worldwide oil and natural gas extraction, made in April 2009. Note that this graph includes both natural gas and oil. But it starts declining, starting about 2010. The graph only goes out to 2050, but by that time, what Campbell calls regular oil is expected to be down to something like 8 “Gboe”, which is equivalent to about 22 million barrels a day. The various non-conventional oils might bring the total up to 12 “Gboe”, or 33 million barrels a day in 2050. In both the IEA’s graph and Campbell’s graph, we are presently at approximately 80 million barrels a day of oil a day, including conventional oil (but excluding biofuels). At 33 million barrels a day we would be producing only 41% of current production in 2050. We don’t know what 2080 might bring, but suppose that oil continues to drop off at a similar rate as forecast between 2010 and 2050. Then we might be talking about 17 million barrels of oil per day (including unconventional oil) by 2080. This would be about 21% of the roughly 80 million barrels of oil per day produced today. All of this is only a rough estimate, just to give a ballpark estimate of what one view of the long term decline in oil production might look like. Even this view has some built in optimism in it–it pretty much assumes that the business of oil drilling goes on as today, with international companies using high tech equipment (made around the world) and experts from around the world. It doesn’t assume huge breakthroughs in technology, but it does assume that there are no major impediments to conducting international business. The problem is that we really don’t know what the world will look like in 2080. Maybe everything will be great–wonderful new technology will have been discovered, and many of our problems will be solved. The problem is that there is also a possibility that somewhere along the line, things will start breaking down. Perhaps the decline in oil production will affect the financial system, or international trade, or even the electrical system. The possibility doesn’t even have to be high percentage-wise. Suppose there is a 5% chance of such an adverse outcome. It would seem like such an adverse outcome could impact the safety of the nuclear power plants. If a nuclear power plant needs a repair, it might not be possible to make such a repair. Political stability might go downhill. Such a change might also reduce the ability to continue mining uranium and to trade it around the world. If nothing else, the huge investment in the nuclear power plant might turn out to be useful for much less than the 60 year planned lifetime. When one is looking out as far as 2080, there is also a possibility that climate change may also be a factor. For example, climate change might cause a shortage of water for cooling, or cause sea level rise in the area where a plant is located. It should be pointed out too, that new nuclear plants are being considered, even in countries we would consider “lesser developed nations” today. Also, countries building these nuclear power plants will want to get the cheapest cost possible. We now read, China builds French reactor for 40% less. We can hope all of the new reactors around the world are built to high standards, and are operated professionally, but it seems to me that there is less and less control possible over this situation. All of this would not be an issue, if nuclear power plants were built in such a way that they could continue to be operated safely, even without trained staff and without decommissioning at the end of their lifetimes. People talk about using thorium, and about recycling most of the fuel, and about various other approaches that might fix most of nuclear’s safety issues. At this point, though, I don’t see these issues as fully resolved. Probably the same issue can be raised for other types of new energy production. It just stands out most for nuclear electricity production. For example, will solar panels de-grade safely? How about all of the batteries used for electric cars? Will it be possible to keep waste from these batteries safely out of drinking water? But we also have huge problems with old energy production. Mercury pollution from coal fired power plants is a huge issue. Even if this pollution is caught through scrubbers, disposal of the coal ash is a problem. I am not sure we have good answers, but before we jump to the conclusion that nuclear is a major part of the solution, it seems to me that we need to think through what the risks really are. This entry was posted in Alternatives to Oil and tagged nuclear, peak oil. Bookmark the permalink. I can 100% guarantee that if there is a nuclear boom in the Third World, many of these states will act exactly as North Korea is doing now, postPeak. They will demand oil or they will threaten to build nuclear bombs, put them on missiles and wave them in everybody’s face. Most of these countries are incredibly corrupt and First World countries have huge numbers of highly corrupt individuals, crime syndicates and venal corporations. People in these countries will be whipped up by phony media nationalism and that will only make things worse. Will we still be in a position 40 years from now to complete the storage process required to secure this waste for over thousands of years? I have no doubt that all of these steps are possible when industrial civilization is operating as it is now, but what shape will it be in 40 years post-peak? I think that the risks are high that waste we have already generated will not be safely secured, much less the greater amount that would be generated from any future expansion of nuclear power generation. Immobilise waste in an insoluble matrix such as borosilicate glass or synthetic rock (fuel pellets are already a very stable ceramic: UO2). Seal it inside a corrosion-resistant container, such as stainless steel. Locate it deep underground in a stable rock structure. The way blockquotes work is you click on b-quote at the beginning of what you are commenting on. You will discover that that changes what is shown to a /b-quote. When you get to the end of the blockquote, you click on /b-quote. It should work OK.
Nuclear is only 6% of world energy, hydro is about 3%. If nuclear energy were 60% of energy the world would be producing 660,000 tons of uranium out of a total resource base of 3-5 million tons rather than 66,000 tons mined a year now. It is a true ‘false fireman’. It is much more probable than renewables(hydro, biomass wind and solar) can save us than nukes(contrary to IIER). Nukophiles are delusional and innumerate. is there a study looking on how decline in the EROI of oil influences the EROI of other resources? E.g. if EROI of oil declines from 30:1 to 10:1 how will the EROI of nuclear power change? I don’t know of one. If the EROI of one fuel declines, effectively what happens is that the price of that fuel has to go up, in order to pay for all of the costs involved in extraction. If the first fuel is used in the extraction of the second fuel, then the second fuel’s required cost will go up too, because it needs to use a higher price fuel (a sign of lower EROI). In your example, the cost of maintaining the wind turbines would go up. At some point I think you can hit discontinuities. If there simply isn’t enough of Fuel A to extract Fuel B, perhaps the whole technology will need to be changed to use Fuel C–assuming it can be done. It seems like in Steve Mohr’s thesis summary, his forecast was for oil and coal to run out before natural gas. This seemed strange to me–how can you run society on natural gas? You would have to convert all of the infrastructure to use natural gas-pretty much an impossibility. EROI (also pronounced EROEI) is a kind of mythical creature. EROI is only rarely glimpsed at TOD. Nobody else even mentions it. DOE, USDA do mention net energy but not the illusive EROI. What does anyone really know about the fabled EROI? Well there WAS a home for EROI but it’s up for sale. It’s not even good enough as a talking point. My problem with EROI is that it is hard to make the different EROI numbers comparable to each other, from one fuel to another. Also, wind EROIs are sometimes done with pro forma data provided by the manufacturer, not with real world data. And even when real world data is used, I am sure it is only for a fairly brief time, so doesn’t take into account real maintenance costs, for example. Nicole Foss, aka Stoneleigh from The Automatic Earth, (also one time Oil Drum Canada editor), completed a study of nuclear power generation in the former USSR in her earlier career. She pointed out in a recent talk that economic collapse tends to severely demotivate those individuals nominally in charge of that optional back-office nice to have stuff, like nuclear safety. And that’s a much faster acting loss of control scenario than the inevitable peak oil decline slow strangulation – just makes the risk all the more likely and more imminent. Not forgetting also that the Export Land Model is expected to have disproportionate impacts on some nuclear powered countries over others too. Exactly! I am worried about this kind of thing happening. If you need to cut costs, and there are some people whose jobs are only needed as a safety backup, or if there are special safety procedures that cost more to do, it seems like funding for these will suddenly disappear. And when the professionally trained engineer leaves for some reason, the nephew of the person in charge, who has been out of a job for 6 months, will suddenly be hired. I assume the Nuclear Installations Inspectorate, along with other regulators like the Health and Safety Executive, are going to be subject to the 25 – 40% cuts underway in the UK Public Sector. Similar stresses must be emerging worldwide, and surely something somewhere is going to hit the buffers. Golgafrinchan telephone sanitisers (from Hitchhiker’s Guide to the Galaxy) provide a good example of the consequences! Until recently I was strongly in favor of nuclear. Why? Because I believe in my heart that climate change is the most dangerous risk we face. Peak debt will make us very very poor. Peak oil will keep us very very poor. But runaway climate change will make us and many other species extinct. What is runaway climate change? It’s what happens when you burn all the coal and non-conventional oil, which is the path we are on. I believed that nuclear was our only hope for getting CO2 back down to the safe 350 ppm level. And yes I understand there are risks, but all energy sources create problems and coal (even setting aside CO2) is far worse than nuclear in my opinion. Then I read the work of Tim Garrett. He proved via thermodynamics and mathematics (two disciplines that I trust more than anything else) that it is not possible to reduce our CO2 emissions to a safe level unless we build one nuclear plant per day. We obviously cannot afford this. And there is no other option except a rapid collapse of civilization, and I mean complete collapse, not just a big drop in GDP. So now that I know nuclear cannot solve our climate problem, I no longer support the risks and costs associated with a large scale expansion of nuclear. That is pretty much the problem with nuclear. I am not sure if it is one a day we need, but we need a lot. And once we get the plants built, we need everything that goes with the plants–transmission lines, and roads to repair the transmission lines, and trucks to operate on the roads. It becomes difficult to maintain the whole system. So yes, maybe 300 GW is one nuclear plant every two days, but its still way too much. The problems with nuclear and climate change are deeper than most people believe. Because nuclear plants require so much concrete to construct, they do not become carbon-neutral for a couple decades after they are finished. Concrete production is a huge source of atmospheric carbon dioxide. In addition, we’re currently driving to extinction about 200 species per day. If we do not terminate the industrial economy, we’ll surely kill every aspect of the living world on which we depend for our lives, and probably within a generation.